"These dessert muffins are moist and flavorful. Perfect for tea time. You would never guess they are gluten-free! They taste best served warm, but you can also reheat cakes in microwave before serving after they cool." Mix bananas, 3/4 cup brown sugar, milk, butter, egg, and vanilla extract together with a stand mixer; add baking mix, pecans, xanthan gum, cinnamon, nutmeg, and salt and mix on Low until just combined into a batter. Pour batter into prepared muffin cups. Sprinkle additional brown sugar over the batter. Bake in the preheated oven until a knife inserted into the center comes out clean, about 20 minutes. Cool in the pans for 10 minutes before serving. 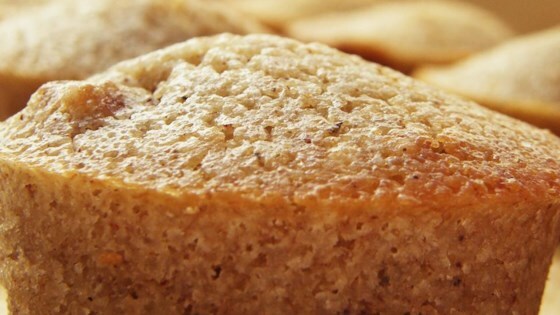 See how to make a kid-approved banana bread with gluten-free flour. I think these would have turned out better if I had baked them longer. These are amazing! The only change I made was to use milled flax seed in place of the zanthan gum. My kids ate them right up and my coworkers loved them!